At the end of each day, each year, and for the rest of our professional lives at Godden Sudik, we want to be able to look back with confidence and know that our efforts had meaning beyond our own interests, that a portion of the profits were used for the greater good and that we made a difference by enriching people’s lives – our people, our customers, our stakeholders and the greater communities we reside within. We believe this to be a noble pursuit well worthy of a life’s work and one for which we are truly grateful. Do you own a house or are you building one? Does is have a roof? Do you want more out of your roof than just shelter? 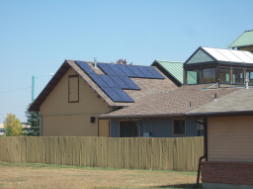 Are you worried about the cost of adding that solar system, well here are some things to consider. First off there are several ways to pay for those photo-voltaic .. .. Thank you for your interest in Godden | Sudik Architects! If you would like to receive updates and our quarterly newsletters please fill out the form below. We promise not to unnecessarily fill your inbox with updates or share your information with the public.